Looking for an application that focuses on multiple areas of language and is motivating for students? You don't have to travel to another planet to find one! 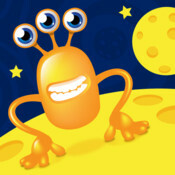 The Speech and Language Store's Splingo's Language Universe focuses on nouns, verbs, prepositions, and adjectives with a three-eyed alien traveling across the universe! Students help the alien travel with his friends from planet to planet as they work on language skills. 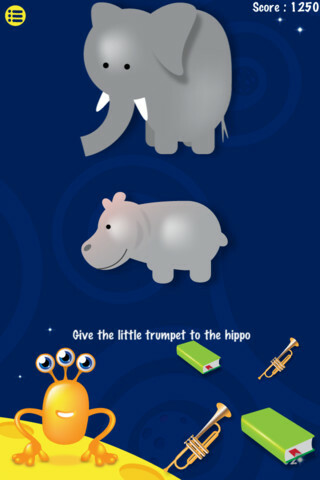 The Speech and Language Store has generously offered three codes for me to give away for this application. To read my review and enter the giveaway, continue reading! Selecting the "Information" text will bring you to information about the application and how to use it. It also has links to e-mail the developer with questions, for support, or comments as well as to their Facebook, Twitter, and website. When you customize the types of words to be used in the application, there are multiple options. If you choose the "Customize" text, in a chart, options will show to choose the number of main words in an instruction/direction for each of the following - nouns, verbs, prepositions, and adjectives. Tap the boxes to choose the amount of words up to four. Green check marks show the number of main words selected and the red "x" means that they are not selected. You can select multiple boxes or just one box. If you choose one box, the application will only have directions with the number of words chosen in the word category. If you choose a whole row, the application will use only the type of word selected with 1, 2, 3, and 4 main words randomly shown in an instruction. In addition to the type and number of words used, you can choose to have the text of the instruction shown at the bottom of the screen each time a direction is given. This option can be toggled on and off by pressing the words "on" and "off" below the "Display Sentence" text. Finally, you can choose between a US or UK voice with or without the alien effect. The voice to be used can be chosen by pressing the text below the word "Dictionary" until you find the voice you would like. Finally, once you have customized everything, press the play button to begin application play with the settings you chose. Level 1 - contains instructions of 1 main word and is suitable for children at a developmental level of 18 months onwards, e.g. "find the apple"
Level 2 - contains instructions of 2 main words and is suitable for children at a developmental level of 2-3 years, e.g. "find the red apple"
Level 3 - contains instructions of 3 main words and is suitable for children at a developmental level of about 3-4 years and upwards, e.g. "find the big red apple"
Level 4 - contains instructions of 4 main words and is suitable for children at a developmental age of about 4 years and upwards, e.g. "give the big red apple to the boy"
The cute, orange, three-eyed alien will then give an instruction. The child must tap the correct image or drag the correct image to the correct location on the screen. 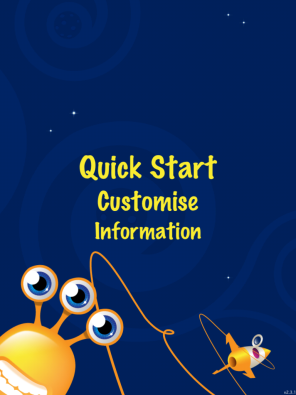 The alien will state the instruction aloud in whichever voice you chose in the "Customize" menu. If you chose for the "Display Sentence" option to be on, instructions will also be displayed in text form. The amount and type of main words in an instruction will depend on what you chose in the "Customize" menu or "Quick Start" option. When an instruction is incorrect, the alien will shake its head and make an "mmm hummm" sound. If the instruction is followed correctly, the alien will do a flip and give verbal reinforcement by stating "correct", "yep yep yep", or another positive statement. Each time an answer is correct, the user will receive points and the application will move on to the next instruction. The user will not receive points for a direction if it is not completed correctly on the first trial. In addition, you cannot move on to the next direction until you get the answer correct. If you need a direction repeated or the text shown again, press the alien. After a certain number of correct choices per planet, a reinforcement puzzle will appear. These puzzles include building the pieces of a rocket, giving the rocket fuel, picking up alien friends to give them a ride, giving the aliens entertainment, and feeding the aliens. 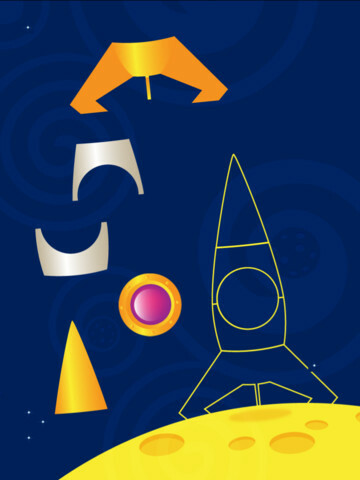 After each puzzle has been completed, an animation will show of the rocket taking off to the next planet with the alien inside. 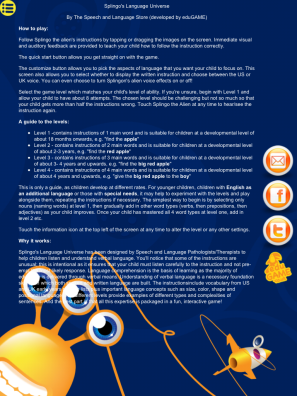 If you choose to end the application play before the child is done due to time constraints or frustration, press the circle with bullet points and lines to go back to the main page. A pop-up will ask you if you would like to continue playing. Press the "No" button to go back to the menu or the "Yes" button if you would like to continue application play. Once the child is done playing the application, press the white bar underneath the text "Please enter your name!" to enter the child's name. His or her name will appear next to his or her score and be lined up in order of other scores on the application. The ability to customize the type of words to focus on is great. Some of my students are working on nouns while some are working on prepositions and others adjectives or verbs. Some are working on more than one word type. This allows me to customize the application experience for each student. It also works great for group therapy when each student is working on something different. I like having the ability to set the difficulty of the application due to the fact that I work with children with different developmental levels, language difficulties, and ages. This also allows me to customize the application experience for each student. Visuals and audio are important to children with disabilities and this application definitely has the appropriate amount of visuals. What I mean by this is that the screen is not too cluttered with backgrounds or images. Depending on the difficulty selected, a certain number of objects will appear for the type of direction and sometimes there are even arrows and animations to help and are developmentally appropriate. Plus, the ability to have the text shown and read to students is helpful as well. Visual and audio reinforcement on this application are also developmentally appropriate and keep children interested in playing over and over. It is great that voices are now available in both US and UK English. This allows for the directions to be specific to the childs' language since there are some words pronounced or used differently in each language. I like that for the instructions that require students to move an object to a specific place based on a preposition show arrows to the choices of where to drag the object to. Also, when an object is "put inside" a bag or box, it actually shrinks as if it is being placed inside or if an object is placed behind another, part of the object is hidden but part is showing. This helps students visualize where the objects are being placed even though they are on a 2D plane. 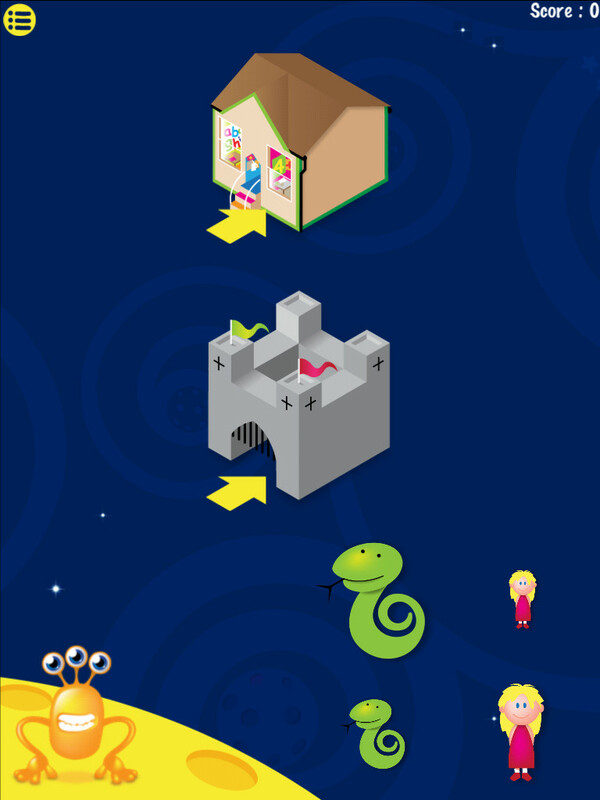 The theme of the application is great from the alien to the planets to the reinforcement puzzles. I am unsure of how many points are earned per correct answer and would like to be able to see which answers a student got incorrect out of a certain number of trials. This would make things easier for me to record. In addition, it would be great to have user profiles so that I can track data on a specific student to see how he or she has improved through using the application. The Speech and Language Store is working on adding 5 "save and return to the game later" slots, so that should help a bit! I would love it if I could choose words in each category (nouns, verbs, adjectives, and prepositions) to be used in the application. Sometimes my students know certain words but not others; so I would like it if I could have more trials of one word and zero or fewer trials of ones they already know. Some of the directions are a bit confusing here and there. For example, one direction asked me to find the circle and showed a soccer ball and a yellow circle. A soccer ball is circular in shape; therefore, this may be confusing to some of my students. Also, even though I had chosen US English, the text of an instruction did not always match the instruction stated aloud. For example, one instruction stated something to the effect of finding the big flashlight but showed text stating "torch" instead of flashlight. It would be good to look into each instruction to make sure that they are assessing what they are supposed to assess, but to be honest, there were very few of these errors. 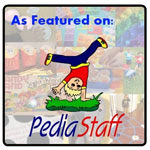 Receptive Language - This application focuses primarily on receptive language skills. Have students focus on finding nouns, verbs, and adjectives to work on vocabulary skills. Those who need to work on following directions with prepositions can click and drag objects to the correct position. 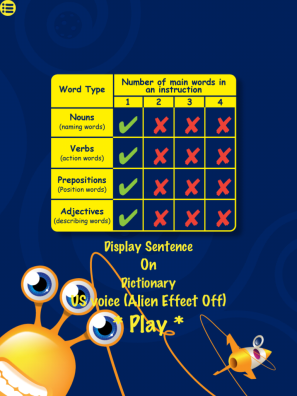 Following Directions - Set the complexity of the directions stated by the alien by choosing how many main words are to be stated in the direction. The child can then follow directions based on the audio and/or textual instructions. He or she will get immediate feedback through audio reinforcement. Another idea is to find a toy alien and other small objects in the application at a store and have the children follow the directions with real objects. Expressive Language - Have children find the noun, verb, preposition/prepositional phrase, or adjective in the instruction's audio or text. Ask them to use the main word in their own sentence or direction. In addition, have the students expand the directions by writing the original direction as well as an additional noun, verb, preposition, or adjective in their sentence. Articulation - Have the child re-state the direction using their articulation sounds correctly. Memory - Have the child re-state the direction stated aloud or written in text on the page. Double check their answer by having them perform the direction or pressing the alien to have it re-stated by the narrator. Splingo's Language Universe is available for the iPod Touch, iPhone, and iPad for $2.99. 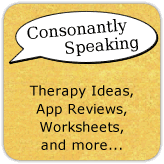 Consonantly Speaking was given three application codes to give away with this review by the developer of the application. No other form of compensation was given.